Anyone in Ust-Kamenogorsk, a city with a large ethnic Russian population in northeastern Kazakhstan, will tell you their city isn’t just a mining hub. It’s a hockey town. The local club, Torpedo Ust-Kamenogorsk, emerged as a hockey force in 1957, when a team of no-name factory workers walked away with a silver medal in an all-Kazakhstan tournament. The club kept winning and quickly through shot the ranks of Soviet hockey, earning promotion to the all-union “A” league during the 1964-65 season. From the 1960s through the 1980s the Torpedo club was a player development machine, producing such stars as Boris Alexandrov – the youngest player on the USSR’s 1976 gold-winning Olympic hockey team. And as the legends of the 1970s got older, they made sure to pass on their skills to new generations in Ust-Kamenogorsk. After a celebrated 15 years as a goalie for the Torpedo club, for example, Victor Nabokov established a notable goaltending school in the 1980s. It produced five goalies who went on to play in North America’s NHL, including his son, two-time All Star Evgeni Nabokov, who is now with the New York Islanders. “He [Victor Nabokov] gave much to this city and to the game of hockey,” recalls Torpedo’s head trainer and one of the team’s all-time leading scorers, Sergei Mogilnikov. He credits such hometown heroes with establishing a passion for the game in Ust-Kamenogorsk (which is known as Oskemen in Kazakh). After the dissolution of the USSR, the team kept up much of its momentum, despite losing many of its players to Russian teams. 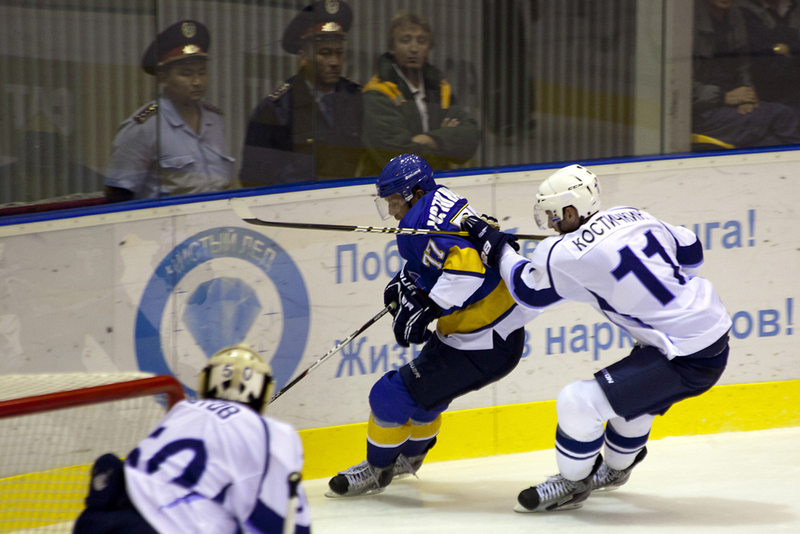 Between 1991 and 2008, Torpedo (renamed Kazzinc-Torpedo in 2001, in honor of the team’s biggest sponsor, the Kazzinc mining company) led the nascent Kazakhstan Hockey League for 12 of its first 16 seasons. “I’ll let you judge. Go see a game yourself,” bemoaned the manager of a local sports apparel shop, 100% Hockey. “In the Soviet Union they were the best.” And the fading glory of hockey is not just a phenomenon at the professional level; youth participation has been declining for years. So what happened to the magic? And where did it come from in the first place? The first explanation most people attribute to the Torpedo’s waning popularity and sliding record is simple: money. Better facilities and better pay have drawn players to other cities, not just in Russia but also Kazakhstan, as Astana and Karaganda have invested heavily in professional teams. On the training front, Torpedo has experienced two great losses in the last decade. Knee problems forced Nabokov to close his goaltending school. And two years after leading Kazakhstan’s Olympic team to fifth place in 1998, legend Boris Alexandrov returned to head up training for the Torpedo, but was tragically killed in a car crash a year later. On the youth level, equipment is expensive and schools only provide modest support; parents have to provide the funds. For those who can afford the equipment, facilities are available. Not only is the Sport Palace – the Torpedoes’ home rink – available for all levels of play, the Kazakhmys mining company recently donated 175 million tenge ($1.16 million) for a new hockey rink, which opened earlier this year. And rumors abound of still another rink in the works. But the issue isn’t just money. Something more intangible has been lost. Keith Mellnick is a freelance writer and photographer currently working in Central Asia.